Capcom's latest zombie opera gets its first injection of new content this month. 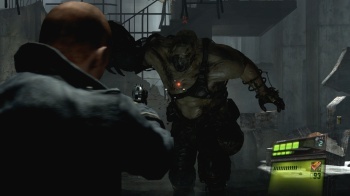 Xbox 360 owners will get the first taste of paid multiplayer Resident Evil 6 DLC on December 18, while the Ada Wong campaign and new "No Hope Left" difficulty level will launch one day earlier for both Xbox 360 and PS3. Three new multiplayer modes will be offered, including Predator, Survivor, and Onslaught, for 320 MS points each, or bundled together for 720 points. In Predator mode, teams of players will take on a single player-controlled Ustanak - a large bio weapon that is difficult to kill. Victory depends on players being able to best the beast within a set time limit. Survivors mode is a team deathmatch scenario where downed players return as enemies and hunt down the remaining survivors. And Onslaught tasks a pair of players with taking down ever-increasing waves of zombies and other nasty enemies, much like Horde mode from Gears of War. Both Xbox 360 and PS3 gamers will be able to get their mitts on the anticipated patch which adds Ada Wong's story, the new difficulty option, and the new camera angle - that pulls back the view to offer a greater glimpse of your surroundings -Â on December 17. No date has been given for when the new multiplayer modes will land on PS3.